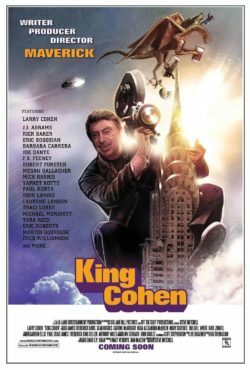 “King Cohen” is an excellent documentary about filmmaker Larry Cohen, whose films, including “It’s Alive!,” “The Stuff” and “Q” have a devoted following of fans, including such successful directors as J.J Abrams, John Landis and Martin Scorcese. All three of these men face the camera and expound on the effect Cohen has had on their own projects. Abrams recalls a time when he was fifteen years old and running into Cohen on a Los Angeles street. Cohen was lost and the young man pointed him in the right direction. Decades later, when the two meet again, Cohen remembers Abrams as the kid who gave him directions. The film looks at the various films in Cohen’s career, with Cohen and others talking about his filmmaking process. Cohen was often a true guerilla filmmaker, often putting a cameraman up on a fire escape and filming the passerby’s reactions. For one film, he required a parade of 5,000 New York City. To get the shot, he dressed Andy Kaufman up as a cop and had him join the rest of the boys in blue in marching across the city. While filming a film dealing with J. Edgar Hoover in Washington D.C., Cohen learns the address where the former F.B.I. director lived and films a few scenes on the front lawn. This film covers pretty much Cohen’s filmography, focusing more on the most popular films, especially “Q” and “The Stuff.” Interviews with fellow filmmakers, crew members and actors such as Michael Moriarty and Eric Roberts gives the viewer every possible look at Cohen’s process. All in all, “King Cohen” is one of the best documentaries about Hollywood to come down the pike in a very long time. Now, if I could only get that Davis baby out of my head!